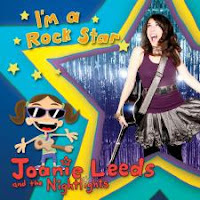 Joanie Leeds and the Nightlights are releasing their newest album titled I’m a Rock Star, today, March 23, 2010. We love music in our household. Papa Bird plays the guitar and Baby Bird and I love to sing and dance. I’ve never listened to Joanie Leeds before and we are always trying to introduce Baby Bird to a wide range of music (not just stuff we listen to) so I thought this would be a great chance to try something new, and I’m glad I did. This CD is perfect for listening to with kids. The songs, written by Joanie, cover both a wide range of topics and genres. From country to dance, Baby Bird and I were bopping away. I have two favorite tunes from the CD. The first is titled I Wanna Be Green. The song has a nice country sound to it and sings about — you guessed it — being green. It reminds me of a really old song I heard as a child called “I’m Gonna Stand Up On the Mountain”. The second song is called I Like Jazz and, right again, it has a beautiful jazz rhythm to it. The songs are a good length for kids to keep them entertained and the words and beat is very uplifting and happy. With the CD has a pull-out poster-like sheet that has the lyrics on it as well as a small introduction for each song. Joanie’s picture is in the CD case as well behind the CD. I’m telling you now, Baby Bird only shares her snacks with people she likes so Joanie, you should feel extra special because after listening to a couple of songs, she tried to feed you her Cheerios! This CD is available for purchase online on their website for the price of $15.00US. You can also buy individual downloads of each song at Amazon.com for $0.99 each. Just leave me a comment below with a way of getting a hold of you if you win. *You must do this for any additional entries to count. Follow Joanie Leeds on Twitter. Please include your twitter id in your comment. Follow This Bird’s Day on Twitter. Friend Joanie Leeds on Facebook. Become a fan of This Bird’s Day on Facebook. Subscribe to This Bird’s Day (at the bottom of the page). This contest is open to Canada and the US and runs until 12pm MST on Wednesday, March 31, 2010. * I received a copy of this CD for free to complete my review. The opinions expressed in this post are mine only and are in no way influenced by any outside factors. Comments for this giveaway are now closed. Thank you to everyone who entered. Using my handy random number generator, comment number 8 was drawn as the winner. Congratulations Pam – I will be contacting you shortly. Please enter me, thank you!